Trains were stopped for about four hours Monday night, until they started moving again early Tuesday morning. Some passengers got off the train and called for another ride. 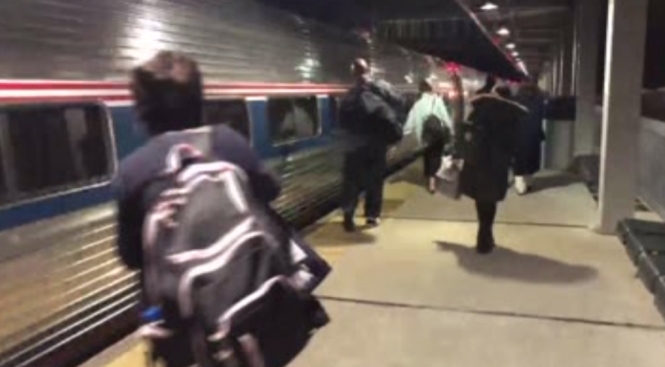 A pedestrian was killed Monday night after being hit by an Amtrak train in Bowie, Maryland. It happened at 11th Street and Chestnut Avenue, Prince George's Police said. The train, Acela 2171, was traveling south at the time, an Amtrak spokesperson said. Two people were trespassing on the tracks about 9:45 p.m. when they "came into contact" with the train, the spokesperson said. There was no word on the victim's identity or the condition of the second person. This was the second pedestrian killed by a train in the same area in less than two months. Trains were stopped for about four hours Monday night. Some passengers got off the train and called for another ride. Those who remained were transferred onto another train. This story has been updated from an earlier version. Prince George's County Police said the impact happened around 10:20 p.m., but Amtrak said it happened about 9:45 p.m.